Here are some do-nots that, if you resort to them, could resort to the demise of your story; but he’ll most likely live, I promise. 1. Don’t stare at your screen for too long. You could be talking or writing your issue out to get your brain working again. Pulling a “Patrick Star” can make you lose your magic entirely. 2. Don’t beat yourself up! These hiccups usually mean you simply don’t know where to begin. Go back over what you have so far, skim through your special notebook or go over your plot again to pinpoint where you’re having trouble and if it needs to be tweaked. 3. Don’t pick up that tin of Pringles. 4. Don’t bring back Dave! “Dave” is that random guy from earlier in the story that you bring back for no good reason. Trust me, readers hate Dave! Taking an insignificant character that has nothing to do with the other characters or your plot can be one of the biggest mistakes you make. Dave is okay and happy where he is but we don’t need to get into where he is. These are just a few of the things we do out of boredom that can ruin our vision. Need inspiration? Look back on some of the Creative Writing Club’s past essays and use one of the exercises. You can use music, other books, and even real people for inspiration. Don’t put yourself in a rut and be productive. It can turn out to be one of those rare occasions where writer’s block isn’t hard to get over at all. 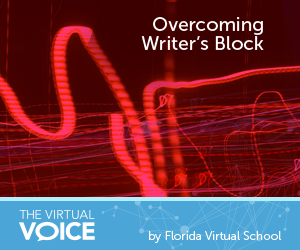 Post by: FLVS Student Téa K.
This entry was posted in Homeschool Edition, Parent Edition and tagged Arts, creative writing, Creativity, English, Essays, Language, Language Arts, Student Voice, Tips for Students, Writer's Block, Writing on March 24, 2015 by Guest Blogger.